DI: It’s the end of another academic year and new shared governance leaders are taking over. What are you proud to have accomplished with this year’s leaders? What work are you looking forward to doing with the new group? Harreld: Well, this is always an interesting time of year because we’re halfway working with the old group and halfway working with the new group as we make these transitions. And it’ll take us a few meetings to bring the new group up to speed on some of the issues. This will be the first full year of an implementation of a new budget allocation process, so I’m finding myself doing a fair amount of educating of how it actually works, and of course we’re also finishing a number of very important searches, and so we now need to make sure the new team gets involved in a number of those searches. We’ll do an orientation for them all to make sure they understand how our regents and the regential system works, what the governance system is here, how it interrelates with the regents and also, very importantly how it interrelates with the state Legislature, so bring them up to speed on all those issues. I think everybody tends to be generally aware of them, but then they have to immerse themselves into the details … So that will take a while, and then each group has their own set of issues. There are a number of issues that the faculty are trying to deal with in terms of taking themselves to the next level. There’s a lot of discussion of what faculty-support mechanisms we need to have in place. Several years ago, some of you may recall, the salaries were a real issue with faculty. We’ve gotten most of those behind us at this stage. On the other hand, the support systems of administrative support, if you want to have guests in class who pays for that, so the whole set of how do you improve your teaching skills, how do you improve your research skills, so there’s a lot of questions there. Staff have another set of issues. 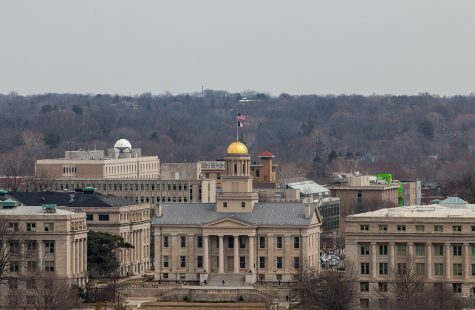 And a very big issue that we’re coming up to speed on is the long-term strategy for half our institution, which is the University of Iowa Health Care System, it’s fiscally about half the system, roughly, and serves over 700 patient beds a day. We’re at capacity, and at the same time we’re very dependent upon referrals, because we do some, we don’t do much primary and secondary care; we’re a teaching center and a research center, so we’re focused with the tertiary, quaternary, so the really complex cases are here. That means that people need to refer their complex cases to us, and as across the United States the system is consolidating and people are starting to actually build big, huge complexes with a primary, secondary, tertiary, quaternary care all integrated, and so they’re more inclined to keep their patients within their own systems, so that’s an issue for us. Then we have huge changes in the Medicare and Affordable Care Act, and all those that are really blasting our economics, and so we’ve got a lot of work to do on that. So, it’s going to be a full summer, full summer. DI: Faculty senators have been working on lifting the AAUP sanction this year and will soon vote on whether or not to lift that sanction. 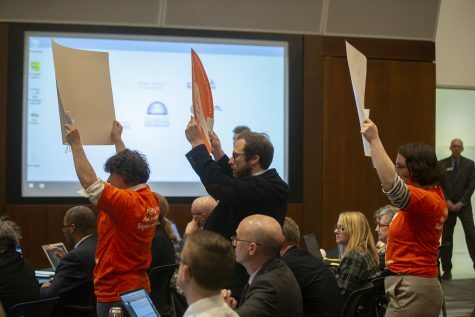 What conversations have you had with Faculty Senate leadership on the sanction? Harreld: Well, it’s a strange dynamic. It was a sanction of the university for the regents, and so I worked whenever our faculty wanted to talk about things I spent time with them on how to deal with it. 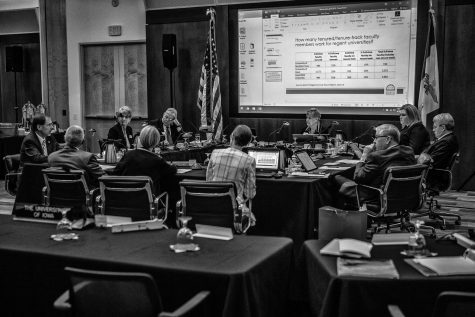 Our regents have been wonderful and have actively been involved, so I helped them engage with our regents, but by and large this has been faculty-led. I would say 95 percent of the issue has been handled by our faculty. At the very end, the group that came to campus, I think as I recall there were two times, AAUP came to campus, one was several years ago and then more recently I think in April. I was actually in Washington D.C. at another set of meetings, and so the next day I did a telephone interview with the individual running the committee that was on campus, spent half an hour talking about shared governance on our campus and the status of it, the importance of it. In my view, I think we’ve taken it to, actually, a very different level and a much higher level of sharedness than on many other campuses, and I wanted to make sure he understood that, because in many other campuses, there’s an active student undergraduate group, there’s often an active graduate student group or active staff, active faculty, but I found myself to be a few years ago the integration point. Very few meetings where faculty, the staff, and students all in the same meeting, and so I was kind of the coordination point and said, ‘This is not good,’ so we’ve actually created a process where we’re all involved in most of the issues simultaneously, which makes it healthier, more creative, probably more complaining, but that’s part of the process. And then we’ll see, I think their annual meeting is in June-ish and we’ll see what they do. DI: Nontenured faculty have recently been protesting in hopes of getting a response from you about issues they’re facing. What is your response to the concerns they’ve expressed? Harreld: … Well, they have all the right in the world to protest and go over to the house. At the same time, I’m trying to help them understand what the process is, and they don’t seem to really care too much about the process, at least so far. The issues of salaries and benefits and what have you are largely established in our colleges. Most of them seem to be in [the College of Liberal Arts and Sciences] when I looked at the list of names — I think 100 percent of them were actually within the College of Liberal Arts and Sciences. That’s where they need to go; that’s where these decisions are — I mean, the last thing any of our deans want me to do is to actually wave a wand and actually change salaries and change benefits. These decisions are collegiate in nature. The second thing — so I’m trying to get them to the right place to the people that can help them. The second thing I would say is … I read that their compensation is way too low and this, that and the other — it’d be really useful to get some data about that, and we benchmark against, as many of you are sick of listening to, but we benchmark against 10 other institutions and we know who they are, we know what their faculty salaries are, we know what their benefit packages are, we know where we are in terms of faculty salaries. If we have a legitimate issue here in terms of gaps in nontenure-track faculty, let’s get the data relative to those peer institutions, let’s figure out what the gaps are, and we’ll go to work on it. Right now what we seem to be doing is just frustrating ourselves with the motions, so let’s get some facts on it. And then finally, if it appears quite likely that they’re thinking about organizing — which is fine, they have the right to do that — but the last thing I can do, and I will not meet with them if that’s the case, because I don’t want to get accused of tampering of one way or the other. That’s their choice, their vote, go for it one way or the other, but my meeting with them opens us up for somebody filing some suit that I was tampering with the process. I’m not going to get caught in that. DI: The first reading of tuition rates took place recently and as Mike Richards announced previously, rates are expected to be set under 4 percent. 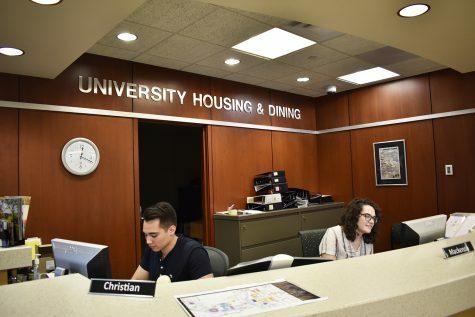 In August, you proposed a plan that was contingent upon 7 percent increases for resident undergrads. You’re getting less than what you planned for. What adjustments will have to be made to ensure the university still is in a position to execute its strategic plan? Harreld: Well, let’s try to do this quickly because it’s an important topic and there’s a lot of dimensions to it. I was asked last summer to do a calculation of what it would take if we only used tuition to fund our strategic plan. We only had one variable, which was tuition, to fund our strategic plan. And that calculation said 7 percent tuition increase a year over the next five years. Now, I think we all know that first of all, made the mistaken assumption that the state wouldn’t continue disinvesting. Secondly, it didn’t look at any other variables. It didn’t look at new programs we might add into the system to create new revenue. It didn’t look at philanthropy. It didn’t look at a whole host of other things. So, the answer to your question is yes, of course we only got a 3.8, I think, percent increase, hopefully that will continue year after year after year. As we do that, we also — we don’t get all that 3.8 [percent increase], we only get about 70 percent of it because as we take our tuition up, we also need to add an increase for those students and families who need more student financial aid. So let’s be clear, 3.8 isn’t 3.8 as it comes to us, but then also we need to go to what I call Plan B, which is we have to plan that the state’s going to continue its disinvestment, just as it has been for the last 20 years, and they may go up and down here and there, but the long-term trend if we sit back and look at it, and our assumption is they’re going continue to disinvest. That means we need to continue to do all we can to get our tuition up, but then it won’t just be tuition. We need to start new programs, I think we need to take a hard look at how we use our campus in the summertime. We have a lot of unutilized buildings and faculty and staff and all the rest of us, and so we might have opportunities there. And I spent last week Friday and Saturday with our Center for Advancement, so I came to a lot of our alumni and saying, ‘Hey look, we need to seriously consider philanthropy not for buildings, or only for buildings, because we still have some building needs, but we really need to get very purposeful about our philanthropy on programs, scholarships, endowed chairs, if you will, the soft side of the institution, because that’s where we really need it’… so it’ll be a mixture of things. And I think the mistake we will make, we have a tendency to take something as complex as our overall fiscal model, money model, and we actually say, ‘What’s the one thing? We have to get it all out of the state or all out of tuition.’ No, we need to do all of those, and so it’s a system and it’s going be a little bit of this and a little bit of that and one year it’ll be this and the next year it’ll be a little bit of this, but I think we’re in a pretty good place because I think we know where we’re trying to go, I think we know what the metrics are around student success and our research. I think we’ve come together with a new budgeting model that puts a lot more people directly accountable for their own colleges, and they own outcomes and student success outcomes and control a lot of their expenses going over within the colleges a lot more. That means we’ve got a lot more people and just a few of us to deal with this. So, stay tuned, but it’s a work in process, but I’m pretty optimistic on this throughout the end of the day. And I didn’t even mention but we’re now on a rhythm … of taking quite a bit of money out year after year, and that will continue through automation, centralization, getting more and more efficient behind the scenes in a lot of things. And, thank goodness … we have a pretty good athletic department and actually, their media rights are going up rather substantially with the Big Ten, so we’re reaching in there and grabbing some of that money to help the academic side of the institution. It’s a lot and all of those are really important. DI: Now that the Speak Out survey results have been released, we know that one of the many things it revealed is that LGBTQ students experience higher rates of sexual violence. What are you planning to do to address that? Harreld: Well, first of all, I really want to thank the whole community. Several pieces are really important here. One is many campuses are on a four-year survey cycle. We’re one of the few that are on a two year [survey cycle]. 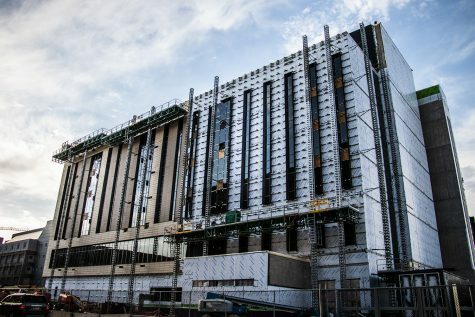 I don’t think four is enough, so two years ago when we started it, we were under a 10 percent response rate, and we learned some things, but we had a hard time looking at any of the cells of different pockets of our community with only a 10 percent — it was actually a 9 point something — response rate. Now we’re over 20 [percent response rate]… so I want to thank everyone, because now I think people are seriously taking it and they know that we’re going to listen to it and it means something and we react to it. There was a little attitude a few years ago, ‘Well, I don’t want to waste my time because no one’s going to listen,’ and I think hopefully people are realizing we do listen. We also tried to streamline the response, the survey, so it was a little easier to take, but then … we corroborated from one survey to the next. We have the same — basically the same — percentage of misconduct in our community percentage-wise, but then now we can look at this particular cell and see that the LGBTQ community is really much more vulnerable, and I don’t know what we’re going to do is a simple answer to your question. We’re sitting down with them, we’ve got to talk to them, listen to them. What do we need to do? I think if I were to propose, or anyone were to propose to them, it would be off the mark, so we’re going to engage with them, talk with them and collectively try to figure out what we’re doing. At the same time, if we just start an exercise looking at other campuses to understand what they’re doing, see if they have the same response rate, and the same degree of vulnerability, I suspect they do. And therefore what program — so if anybody in the room or anybody listening to this has ideas what we should do, let’s go. We’ve got an issue here, and we’re going to deal with it, but to presuppose how to fix it, I think is unwise. DI: The Speak Out findings were also criticized for not showcasing the responses from the 92 students who identified as a gender other than male or female. Do you have any concerns about that or would you have showcased the responses differently? 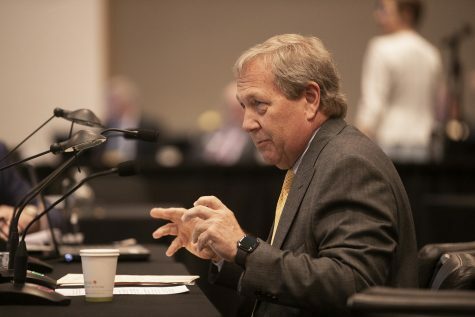 Harreld: No, at some point two things happen… it’s like where we were two years ago, we didn’t have enough response rates to really draw meaningful conclusions, accurate conclusions from a small group. So I think that’s one thing that happens, but secondly, at some point if you start showcasing specific results in a small group you start actually exposing who it is, people, start [becoming] identified and we did not want to get into that. Having said that, we’ll meet with all the people, so there wasn’t an attempt to do anything other than protect the integrity of the system, the process, and people who have took this survey. DI: People felt there was an over-representation of transgender students in the responses versus society and even just on the UI campus, so that’s why they felt the sample was representative enough. Harreld: Yeah, but boy you have to be careful, and we’re going to get into this discussion. Remember last time… with a 9 percent response rate across the entire population two years ago, we didn’t have enough people … the number of people in the LGBTQ segment was so small that we couldn’t go in there with any statistical validity and prove there are issues and we doubled the response rate and now we can go into that group. We may need to double it once again to go into a community that’s only 1 percent of the total, or 2 percent of the total [population], that’s what I’m referring to. And then when you have something less than 100 [respondents], if we start actually putting in any specific quotes or concerns, we’ve got to be careful that we don’t actually unintentionally expose anybody that doesn’t want to be exposed, so I don’t think there was any intention — so, said another way, let’s sit down and go through the issues. We’ve got now some data. I think we probably don’t have enough statistical proof to say for sure, so the only way we … can go next is sit down and start having conversations. When we’re dealing with a large data, we’ve got 20 some percent, we can make some pretty good predictions about so what’s some of the issues are and what some of the things we might want to do about it when you’ve got a group that is that small, even though it may be more or less representative of the total population. By the way, I don’t think there’s good data nationally on this issue having looked at it. It varies quite a bit as to what the national is. So… I think behind your question or maybe someone’s question is this implication that we’re trying to not help that community. Just the opposite, we’re going to stand up and do whatever we can, so let’s get going. Let’s not worry about surveys. 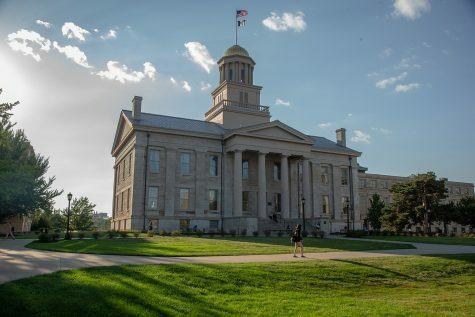 DI: Just this week, the Iowa Legislature passed the fetal heartbeat bill which university officials have said puts the UI at risk for losing accreditation with its OB/GYN residency program. Gov. Reynolds is expected to sign the bill soon. Have you had preliminary conversations about this possibility with UI officials? Harreld: I don’t know what it is yet, so I need to read the bill. I think we all need to catch our breath. It happened very quickly and late at night and there was a lot of mystery — at least on my end — as to what exactly is in that bill. And I think it really does matter, because I think at the end of the day, you’re asking the questions about the OB/GYN and the residency program and I don’t know is the answer right now. Here’s a state that actually is screaming for medical doctors, has a shortage of OB/GYN in particular, and we decide to do this, and it could — it could — actually jeopardize our training and certification. But I don’t know that yet, and I think we need to take a look at what’s in there, understand what it is and then decide what are the options. It could well be that it’s going to be a tragic step backwards for medical education, for OB/GYN. One of our physicians last night spoke up aggressively on it. Also I don’t think at that point we had any idea what’s in the bill, nor do I now, so let’s be careful. DI: So the 2020 Initiative was expected to have its Phase II report ready around spring break, but we haven’t seen that yet. Are you aware of what stage in the process it’s in at this point? Harreld: I think they’re still discussing. I think they’re still drafting. I was aware of that, but I haven’t seen anything that you haven’t seen at this stage, nor have I had any meetings on it. This is 98 percent within the faculty and within the provost, within the deans and they have a tendency to want to get every ‘T’ crossed and ‘I’ dotted before it comes to me, so I have not seen it. 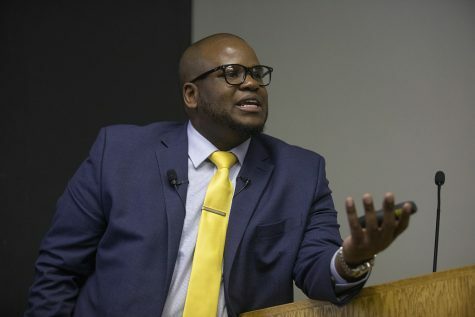 DI: The DI has published some content this week highlighting the experiences of black students on campus have and not always feeling welcomed here. What is your response to their feelings and thoughts on what the university can do? 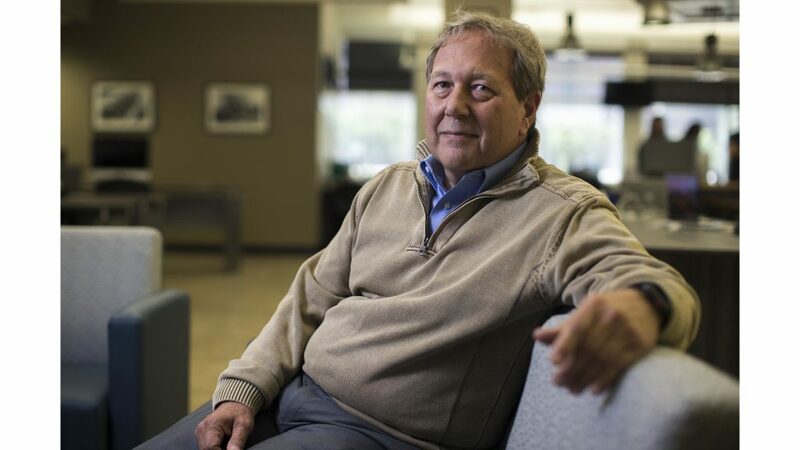 Harreld: My heart goes out… I don’t know whether to call it a editorial or maybe a journalistic trend that you’ve created here in the last couple weeks and I think it’s a really good one. I like it because they’re deeper, more meaningful, and you get the voice of a lot of different people into the process. I think the recent black piece particularly from the Chicago and what it’s like and what it’s like here, I think it’s very important … I’ve been meeting with faculty for a lot and staff over at the [President’s Residence] for a lot of late afternoon conversations where we talk about what we need to do to be more robust in terms of recruiting of under-represented minorities, blacks in particular, how we can engage with black faculty members and helping them in the recruiting process, what we need to do in terms of the infrastructure we’ve created on the West Side of campus with the African-American House, the [Asian Pacific American Cultural Center], [Latino Native American Cultural Center], and what have you, the LGBTQ [Resource Center] as well. And this is definitely an area that we need to a lot more work. Part of it is the support systems we have on campus are insufficient; part of it’s also training, so that all of us not part of these groups can recognize what they’re going through and try to figure out mechanisms so we can support them and help them and also so we can interact more, but again, I think the right way to approach these is to sit down and say, ‘Okay, let’s get engaged in solving this.’ Melissa Shivers [UI Vice President for Student Life] has been all over this in her not quite one year here. There is a specific reason why when [Interim Chief Diversity Officer] Lena and Michael [Hill] decided to go to Washington and Lee, I thought that the right thing to do is to engage Melissa as the interim chief diversity officer, because she’s taken some pretty significant steps already. And we’ll kick off the search here in the next couple weeks for that position long term. We’ve got a lot of work to do in this area, and part of it is the mentoring system that is still ad-hoc on this campus for all of us — for students and faculty — so one of the things big time in my mind is how we more formally connect people who need help with people who have advice, and we have doubled, you’ll find the numbers, but we’ve dramatically increased the counseling office for students. But in many cases, this is something different than the counseling. They need mentors, they need role models, they need safe zones, and in that context we’ve got a lot of work to do, and it’s a journey.